Gunmen on Wednesday kidnapped 20 employees of a government agency that cares for Sunni mosques and shrines nationwide, and the organization suspended its work until further notice, an official said. 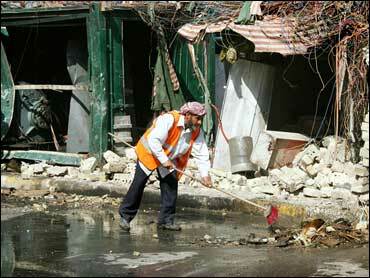 Also Wednesday, at least 20 people were killed in a string of bombings and shootings, mostly in Baghdad, police said. They included a senior Interior Ministry official slain on his way to work, police said. Sixteen other bodies were found in widely separate parts of the country, apparent victims of sectarian death squads. The announcement by the Sunni Endowment, a major institution within the Sunni community, further escalated sectarian tensions. Endowment spokesman Mahdi al-Mashhadani said the employees were seized as they drove from Baghdad to their homes in Taji, just north of the capital. He said the agency would stop working effective immediately and that its chairman, Ahmed Abdul Ghafour al-Samaraie, would give more details later. Also Wednesday, six people died when a bomb hidden in a plastic bag exploded inside a vegetable shop in eastern Baghdad, police Lt. Ali Abbas said. Five more people were killed in three small blasts in the Karradah district of central Baghdad, Lt. Mohammed Khayoun said. In west Baghdad, gunmen killed Maj. Gen. Fakhir Abdul-Hussein Ali, legal adviser to the Interior Ministry, as he rode to work. A roadside bombing killed two people Wednesday in Kirkuk, 180 miles north of Baghdad, police said. Also Wednesday, three others were killed in small-scale attacks in Baghdad and Yousifiyah. Officials and witnesses say at least 53 people were killed and 105 wounded by a suicide bomber who struck Tuesday morning across the street from a major Shiite shrine in Kufa, hoping to line up work for the day. The attacker, driving a minivan, posed as an employer, had a group of job-seekers get in the van, which he then blew up. Iraqi Prime Minister Nouri al-Maliki, a Shiite, condemned the attack and promised to track down and punish those who planned it. Also Tuesday, seven Iraqi police were killed and two were wounded in a bombing near Hawija. U.S. Commerce Secretary Carlos Gutierrez arrived in the Iraqi capital for meetings aimed at jump-starting the economy Tuesday. Gutierrez signed an agreement with the Iraqis to encourage foreign investment, acknowledging that the country's deteriorating security made that goal a challenge. To the south, clashes erupted between gunmen and Iraqi security forces in the tense area between Youssifiyah and Mahmoudiya, another flashpoint of sectarian tension. A member of a Shiite political organization and two of his bodyguards were gunned down Wednesday on the highway between the two towns, police said. One person was killed and five were kidnapped Wednesday in Mahmoudiya, police said. The violence comes a day after a suicide bomber killed 53 people near a Shiite shrine in the city of Kufa, south of the capitol, by luring a group of laborers into his van. The suicide driver then detonated the vehicle on a busy street, local officials said. A 24-hour driving ban police imposed in Kufa and its twin city Najaf to prevent future attacks also expired Wednesday amid relative calm, as shop owners began clearing debris. The ongoing surge in sectarian killings has tarnished the image of the new unity government of Prime Minister Nouri al-Maliki, which took office May 20. The killings have occurred despite a much heralded security plan for Baghdad unveiled last month. Prime Minister Nouri al-Maliki, a Shiite, has called on all political groups to band together to halt violence that has pushed the country to the brink of civil war, warning last week that this could be Iraq's "last chance." The United Nations reported Tuesday that nearly 6,000 civilians were slain across Iraq in May and June, a spike that coincided with rising sectarian attacks. The report said 2,669 civilians died in May and 3,149 in June, the first full month of the al-Maliki government. An AP count showed at least 696 Iraqis were killed in sectarian or war-related violence in the first 18 days of July. That's a sharp rise over the same period last year, when an AP count showed more than 450 Iraqis were killed.